I still remember the first time I took death seriously. I was in my early teens, and my family and I had gone to visit my aunt and uncle in Xenia, Ohio. My uncle kept a horse stable on their land, and one afternoon, he asked me to help him feed the horses while they were roaming in the adjacent corral. I was cleaning up one of the stalls when one of the stallions that my uncle was still in the process of breaking burst through the plank that separated the corral from the stables. I ran out of the stall to see what was causing all the commotion—just in time to watch the beast barrel past me and into the same exact stall. My uncle and I exchanged a meaningful look as both of us considered the possibility that, with a few seconds’ difference, I might have ended up getting kicked or trampled. In hindsight, I can admit that the horse probably would have been spooked by my presence and left me alone–but the danger felt real to my naïve, middle school mind, and it was the first time I can remember thinking, “I could have just died.” It wouldn’t be the last. Over the last few weeks, death’s been on my mind a lot. What’s raised its specter is Banished, an unassuming sandbox city-building game from Shining Rock Software that was just released on Steam this February. At first blush, its premise seems to inspire anything but morbidity; following in the wake of series like SimCity and Tropico, Banished places the player in charge of developing an uninhabited region of remote wilderness into a self-sustaining, self-perpetuating Iron Age settlement. As in other city-building simulators, this process requires vision, adaptability, and a delicate balance of resource management and carefully-planned expansion. 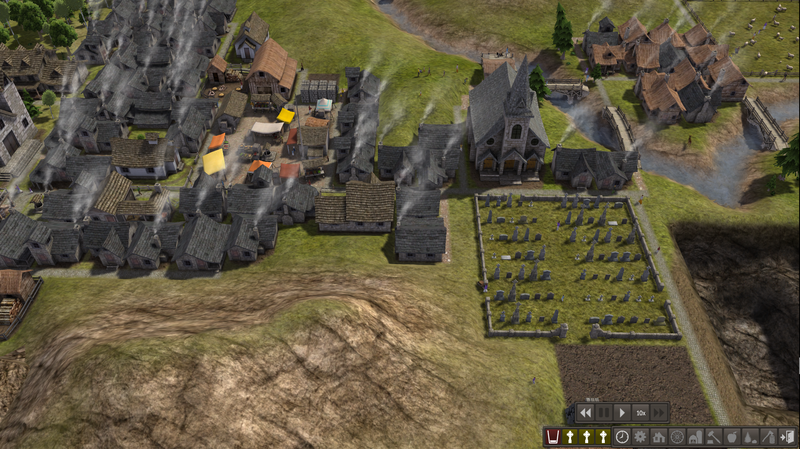 What makes Banished unique, however, is the relationship it facilitates between the player and the inhabitants of his or her settlement. As the game’s website states, “The townspeople of Banished are your primary resource.” This means that unlike the population in larger-scale games, your citizens are not a mere number on a counter: they are unique, named individuals. They live in homes. They marry their neighbors. They give birth to children. They labor at the farms, smithies, tailor shops, and coal mines that you tell them to build. As the in-game seasons rise and fall, they participate in the rhythms that shape human life. The first time one of my citizens bit the dust, I panicked. 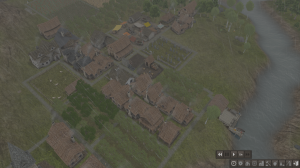 I had spent about thirty minutes developing the settlement of Thull from a homestead of four families, five houses, and a barn, into a budding village with a fisherman’s dock, a wheat field, an apple orchard, a woodcutter, a tree farm, a rock quarry, and about a dozen or so homes. My citizens were well-fed, they had enough firewood to keep them warm through the winters, and they were reasonably happy. Then the notification came across my interface: Jaren the Farmer had died of old age, and there was no laborer available to take his place. Out of the four possible job assignment slots for my wheat farm, only three were now full. I figured I must have done something wrong. Maybe I should have built a tailor’s shop, so that Jaren would have had warmer clothes. Maybe I should have assigned Jaren a job that was less demanding than farming a wheat field day-in and day-out. Maybe I should have upgraded his wooden house to a stone one so that he would have been more comfortable during his final days on his tiny patch of earth. But even if I had done these things, Jaren wouldn’t have lived forever. Nor would he be the last to die. Only a season later, his neighbor Wenifer died too—she was a stonecutter by trade, working in the quarry, and her life was tragically cut short when she was crushed by a falling rock. Then, Elville died. Then, so did Leremy. As the seasons passed and the death toll mounted, I began to feel mournful for the dwindling population of Thull. I built a cemetery to house their graves, so that their relatives wouldn’t become lost to depression (seriously, if you don’t built a cemetery, your people become unhappy when their friends pass on). I built a stone church and appointed a cleric so that my people would have something to hope for. All the while, though, I felt a keen sense of despair. Somehow, I had driven this tiny mountain town and its people deep, deep into the cold, hard ground. The village of Thull…before I drove it into the ground. What I didn’t notice in that first play-through of Banished was that while Thull’s geriatric citizenry was dying off, their children were having children. Given enough time, these children would go to school, become adults, bring their education to bear on their respective vocations, and begin having children of their own. The village would survive. Unfortunately, a lifetime of videogames has conditioned me to equate death with failure, so I scrapped Thull and founded Archet instead. Archet was substantially more successful–one year, the crops were so bountiful and the available houses so plentiful that I had a baby boom. My population increased by 50%. A few old-timers died off, but I was starting to learn that this was to be expected. I built my graveyard and watched it grow full. Everything was fine until my Baby Boomers hit retirement age; then, in one year, I lost a full third of the village’s populace. My graveyard couldn’t accommodate all the tombstones. The survivors grew despondent and less productive. Archet had, like Thull, become a town oppressed by memories of the dead. 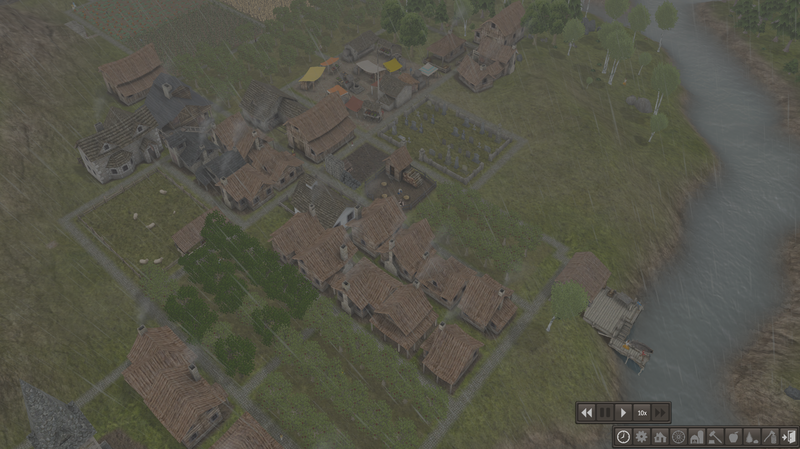 The slightly-more-successful village of Archet…before its citizens all started dying off. Thendt was different. I built Thendt with the dead in mind. Its church was among its first structures, and its cemetery could fit 144 graves. I gritted my teeth and told myself that no matter how many times I was told “So-and-so the Farmer has died. There is no laborer available to replace So-and-so,” I’d keep at it until my settlement was either a flourishing hub of production and commerce or a ghost town left skeletal by hypothermia and starvation. And it worked. I grew my town steadily, never getting too greedy, recognizing that a baby boom now would mean the decimation of my workforce later. Seasons passed, men and women died, but the population grew. Yesterday, it reached 300 citizens, nearly a third of whom have yet to reach adulthood. It’s become a center for regional trade. Nomads come from miles around, asking to settle there. Its fields, orchards, and pastures contain every crop, fruit tree, and type of livestock available. And it has three graveyards. All of them are full. The village of Thendt, with its graveyard. With death always hovering so menacingly over gamers’ shoulders, waiting to visit the sins of failing upon them, it can be hard to remember something so universally basic that it’s become a truism: death, as the cliché goes, is an inevitable part of life. You may earn enough Lifetime Happiness to sustain your favorite Sim’s existence into boundless perpetuity. Years of patience, practice, and a little bit of luck may yield a deathless Megaman X run. If you’re extremely dedicated, you might even make it through Dark Souls without succumbing to the reaper’s blade. But when we’re not wielding a keyboard or controller, we inhabit the same reality as Jaren the Farmer. Eventually, our lives will end, whether we get crushed by a rock, get buried in a cave-in, freeze to death, starve to death, or simply die of old age. I’ve no way of knowing whether or not the citizens of Thull, Archet, or Thendt were paragons of brotherly love as the Thessalonians were, but they seemed to aspire to live quietly, mind their own affairs, and work with their hands. I certainly never saw them placehacking the steeple of the town church to assert their being or anything. Even with the graves of their forefathers growing mossy under their tired feet, they seemed content. Granted, at the end of the day, they were just a bit of code running through a CPU–but in spite of that fact, their brand of peace still seemed inflected with a type of holiness. 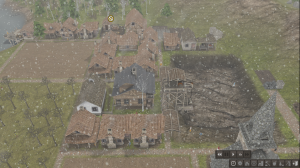 Banished is not a game about progress; there is no “winning,” and while you can earn achievements for reaching certain population milestones, these feel largely perfunctory, an unappetizing carrot hanging from the end of a rather short stick. While decades of gaming may condition players to push for population growth, success isn’t measured by advancement; it’s measured by sustainability. 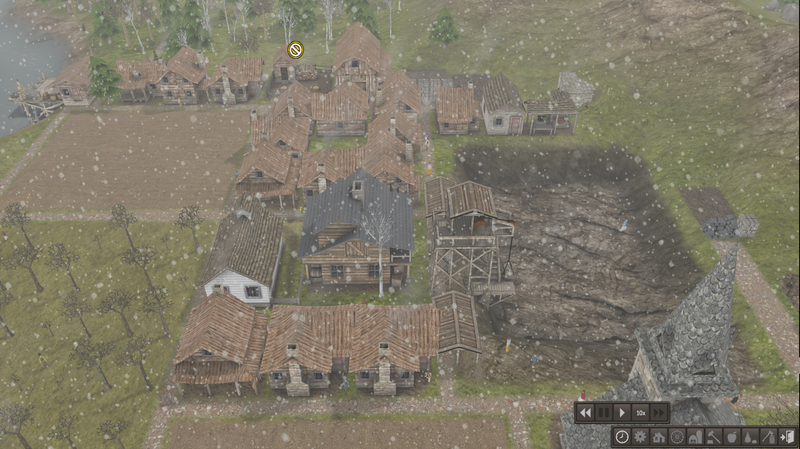 Banished is really about rhythms and cycles. As Rowan Kaiser at IGN notes, “Its difficulty doesn’t come from struggling to figure out what’s happening or how to understand it, nor from arbitrary events like time limits or invasions… but instead from the rhythms of play.” While that may be the game’s primary source of challenge, it’s also the feature that makes it a beautiful piece of virtual art. The more you play, the more these rhythms and cycles begin to feel natural; you learn to accept the inevitability of feast and famine, joy and sorrow, life and death. You learn to accept the gifts of bumper crops and baby booms with thanksgiving, and you learn to let go with a sense of gratitude when blessings fade. If there’s something Banished has to offer us, then, it is a picture of the contented life—one in which labor bears fruit (sometimes), life begets life (usually), and death, despite its sting, ultimately has no victory.